Three police officers escorted a university student to the San Ignacio court this morning. Vince Garbutt was handcuffed, as he made his way to the courtroom of Magistrate Nardia Morgan. 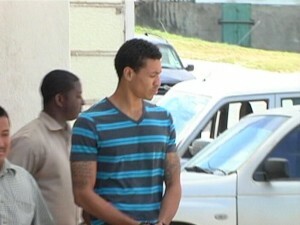 He was detained and remained in police custody over the weekend for the murder of his ex girlfriend, Kayla Pandy. 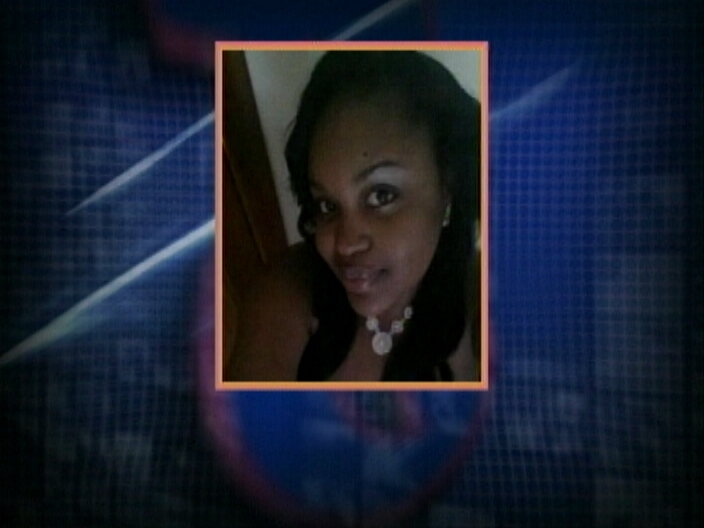 Pandy left her home in Independence, driving herself to Bullet Tree Falls, Cayo, on Thursday. By the evening of the same day she was found dead in her own car. Swift police work led to Garbutt’s arrest and this morning he was stoic when he was arraigned for Pandy’s murder. News Five’s Isani Cayetano reports. Twenty-one-year-old Vince Garbutt, who has since confessed to killing Kayla Burgess last Thursday in San Ignacio, was today arraigned before Magistrate Nadia Morgan. Garbutt was read a single count of murder when he appeared in court unrepresented this morning. From the dock, he briefly explained that a partially accurate confession statement had been provided to police in the absence of legal representation, subsequent to his arrest. The twenty-four-year-old former UB student from Independence was found strangled inside her vehicle after reportedly being abducted and held for ransom. Kayla’s lifeless body, a zip tie said to be fastened around her neck, was left slumped inside the 2005 Kia Sorento. The gruesome discovery was made later that evening by residents of Bullet Tree Falls. 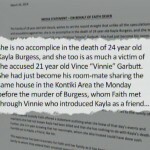 While news of the murder spread like wildfire across social media, including speculation of the involvement of Garbutt’s roommate, eighteen-year-old Faith Dueck, her attorney, in a release issued earlier today, addressed the reports. 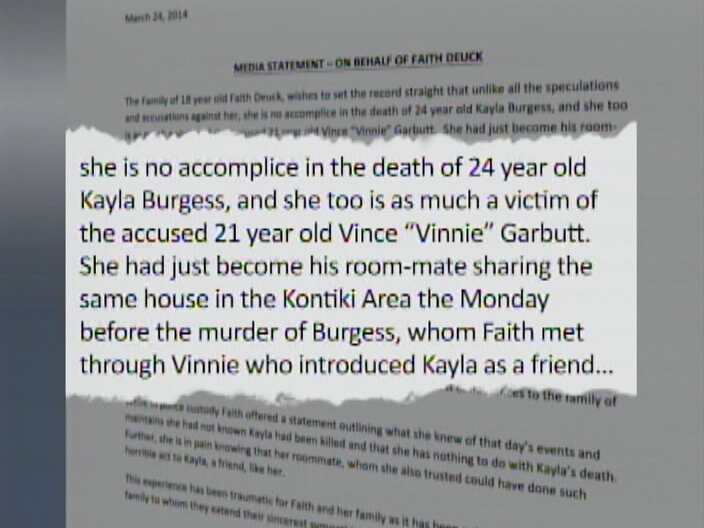 The statement on behalf of Dueck says, quote, she is no accomplice in the death of twenty-four-year-old Kayla Burgess, and she too is as much a victim of the accused, twenty-one-year-old Vince “Vinnie” Garbutt. She had just become his roommate, sharing the same house in the Kontiki area the Monday before the murder of Burgess, whom Faith met through Vinnie, who introduced Kayla as a friend…, unquote. Dueck, who was also detained following the incident, has been released from police custody. Garbutt, on the other hand, is on remand at the Belize Central Prison until June twenty-fourth. 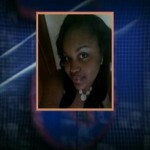 News Five understands that Garbutt, a student of Galen University, is a deportee from the United States. Don’t worry Garbutt our incompetent DPP isn’t going to be able to link you to this murder.This is going to be another “Nolle Prosequi” Make sure to request that Hanomansingh be the presiding Judge. what a handsome guy. hope he comes out quick and kill someone else. anext client for Mr. Dickie, it’s so worrying to see that for the criminals there’s a top lawyer that not even the DPP can handle good but mein wish I studied law so I would fight for the victims and the victims families like in the last case and other and this coming one. I wonder is there any lawyer that can stand up against the genius Dickie B. cause this guy really tops any other one. my condolence to the family of the young lady, this goes to the family, in case you’re case come failure this this past one keep in your hearts that God almighty is better than Dickie and will serve as a better lawyer and Judge on the final day. this world is full of injustice but we have a God that one day He’ll do justice as it should be! @elgin Martinez it’s sad to see u back this guy up. U look and sound like a fool. The only reason ur indifferent to this girls life is because it didn’t happen to ur mom, sister, aunt or even grandmother. Think before you speak I hope he goes for life on this murder. Don’t worry Garbutt our incompetent Authorities will not be able to find the person who Kills you too!! The police officers who are investigating this case needs to take pictures of all the marks that was found on the accused. The investigators also have to see if they can obtain any DNA evidence from under the murder victim’s fingernail. It is very frustrating to know that we have such incompetence in the police department, and in the DPP’S office. So many families have been made to suffer and endure additional grief due to the lack of conviction on the part of the DPP AND THE POLICE DEPARTMENT.